In trying to understand the atom, physicists built quantum mechanics, the most successful theory in science and the basis of one-third of our economy. They found, to their embarrassment, that with their theory, physics encounters consciousness. Authors Bruce Rosenblum and Fred Kuttner explain all this in non-technical terms with help from some fanciful stories and anecdotes about the theory's developers. They present the quantum mystery honestly, emphasizing what is and what is not speculation. Quantum Enigma's description of the experimental quantum facts, and the quantum theory explaining them, is undisputed. Interpreting what it all means, however, is heatedly controversial. But every interpretation of quantum physics involves consciousness. 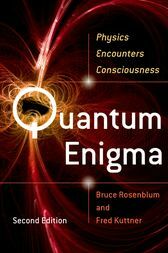 Rosenblum and Kuttner therefore turn to exploring consciousness itself--and encounter quantum mechanics. Free will and anthropic principles become crucial issues, and the connection of consciousness with the cosmos suggested by some leading quantum cosmologists is mind-blowing. Readers are brought to a boundary where the particular expertise of physicists is no longer the only sure guide. They will find, instead, the facts and hints provided by quantum mechanics and the ability to speculate for themselves.In the few decades since the Bell's theorem experiments established the existence of entanglement (Einstein's "spooky action"), interest in the foundations, and the mysteries, of quantum mechanics has accelerated. In recent years, physicists, philosophers, computer engineers, and even biologists have expanded our realization of the significance of quantum phenomena. This second edition includes such advances. The authors have also drawn on many responses from readers and instructors to improve the clarity of the book's explanations. Bruce Rosenblum is currently Professor of Physics, emeritus, at the University of California at Santa Cruz. He has also consulted extensively for government and industry on technical and policy issues. His research has moved from molecular physics to condensed matter physics, and, after a foray into biophysics, has focused on fundamental issues in quantum mechanics.Fred Kuttner is a Lecturer in the Department of Physics at the University of California at Santa Cruz. He devotes most of his time to teaching physics after a career in industry, including two technology startups, and a second career in academic administration. His research interests have included the low temperature propoerties o solids and the thermal properties of magnets. For the last several years he has worked on the foundations of quantum mechanics and the implications of the quantum theory.